Central Minnesota Fabricating (CMF) is located in Willmar, Minnesota and is a family-owned company. We provide structural steel packages to contractors and owners for multi-story commercial buildings, retail locations, manufacturing facilities, hospitals, worship centers, schools, condominiums and sports facilities. CMF's origins date back to 1949 as a steel scrap yard. 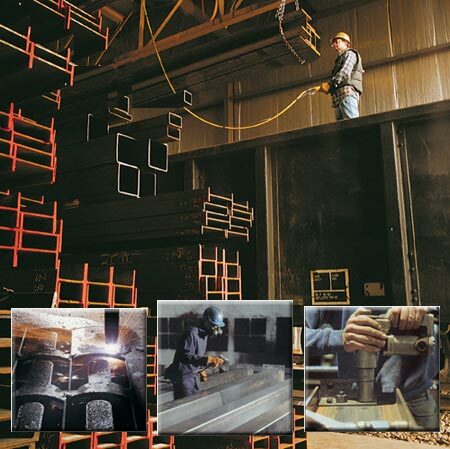 In 1978, the owners identified the need for structural steel fabrication. This resulted in splitting the fabrication side of the business, calling it Central Minnesota Fabricating. CMF was built with the sole focus on meeting structural steel needs of contractors, owners and project managers. Over the years, CMF has grown through several expansions and improvements in technology. It regularly invests in the latest fabrication equipment and drafting software, giving customers peace of mind that we will meet their budget, specifications and project timeline. As CMF grew, so did its customers and its geographical reach. Today, CMF has completed jobs across the country. We look forward to partnering with you and showing you why CMF's steel is "Trusted to Fit." CMF - Our team is ready to serve you!